Advertised as 3.5 stars, but rates one star at best. Dirty, run down and poor location. Do not stay here! This property was very outdated. When we got to the room it was dirty and smelled horribly. No towels and the bathroom glass was dirty. Very disappointed. Had to cancel my booking and stay some else. Room way too small. No balcony. No alarm clock. Floor of the room was slanted toward the hallway. Location is good and the room was clean. This is supposed to be a non smoking hotel, however any time I turned on the air conditioning smoke was pouring into my room. I called and complained many times throughout the night and day. They could not figure it out, when I asked for a refund so I could leave to a different hotel, they could only give me the $25 hotel fee back. Lots of rust/corrosion in the bathroom and mirror in bathroom was old and foggy. I was going to a wedding and there are no other mirrors in the room. A full length would have been nice in the bedroom. Convenient location to many activities. Parking lot is tight. Not recommended for large vehicles. But facilities are very safe, secure and clean. Looking forward to my next stay. They definitely need to replace their mattresses.The 1st room I was given had a mattress that was super worn in-molded lumps & saggy. The room they gave me next was almost as bad. The mattress sloped badly to the right. I did find 1 foot on the left side that was semi-straight. Daily Amenities charge $26 and not included drinking water even a bottle of water in the room.Only on lobby with a small cup. How can u come down to lobby every single time for drinking water for every single thirsty. Have to buy plenty of water and bring to your room. We had a comfortable, pleasant stay. The Staff was friendly and responded quickly to any request. This hotel is not located on the beach, but it is conveniently located within a short walking distance to the beach. If you plan on getting out to experience Oahu and only use the hotel to relax at the end of the day, sleep, and shower, then this is an excellent choice at a reasonable price. Great location and friendly staff made this mid price hotel stay. The furniture was rather dated wicker. Couch could have stood a cleaning. Bed comfortable. Bathroom was clean. I had a problem with the sliding door to the balcony which was speedily taken care of. Location was a little far from the center of Waikiki but shuttle was great. Resort fee a little steep for the services you get. I was alone this visit and would stay there again. 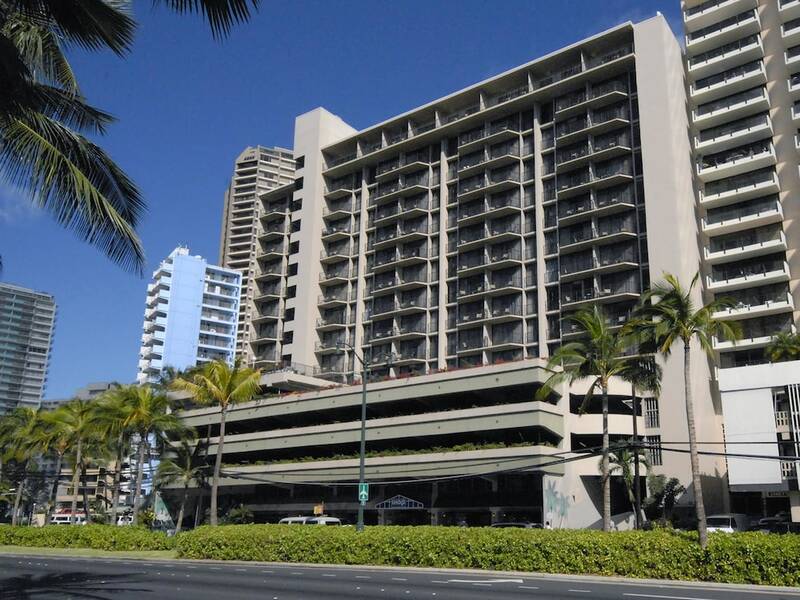 Aqua Palms Waikiki places you in Waikiki, within a leisurely stroll of popular sights such as Hawaii Convention Center and Ala Moana Beach Park. This 262-room hotel has a restaurant along with conveniences like an outdoor pool and a fitness center. Enjoy a bite to eat at IHOP, the hotel's onsite restaurant. Guests can expect to find WiFi and 42-inch an LCD TV with a DVD player and a video-game console. The pillowtop bed provides a full night's sleep and the bathroom offers hair dryers. Other standard amenities include a lanai, a refrigerator, and a microwave. At Aqua Palms Waikiki, guests enjoy an outdoor pool, a fitness center, and a rooftop terrace. Self parking is available for USD 25 per night. Multilingual staff at the 24-hour front desk can assist with securing valuables, dry cleaning/laundry, and tours or tickets. Additional amenities include free WiFi in public areas, a 24-hour business center, and coffee/tea in a common area. Thank you for staying with us. We appreciate your review. We sincerely apologize for any inconvenience you've encountered during your stay. We hope your were able to let the front desk know to help make your stay a bit more comfortable. Thank you again and Mahalo! Thank you for staying with us. We greatly appreciate your review. Our staff strives to provide excellent service for our guests. We hope to see you on your next visit with us. Aloha, Thank you for staying with us and proving your rating on us. We truly appreciate your patronage and hope you visit us again soon! Happy New Year! Thank you for staying with us. We appreciate your review. We sincerely apologize for all the inconvenience you've encountered during your stay. Thank you again. IHOP - Restaurant serving breakfast, brunch, lunch, and dinner. Kid's menu available. Recreation features at Aqua Palms Waikiki include an outdoor pool and a fitness center.